Add a striking element of moving water to your pond using the Little Giant F-Series Wet Rotor Pump. 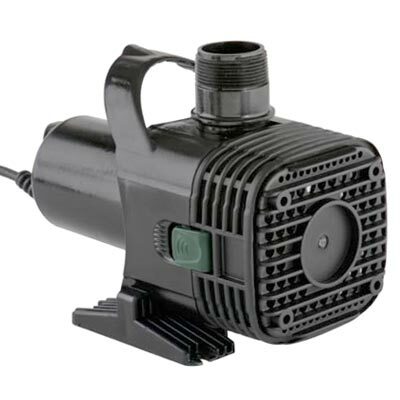 This truly versatile pump offers a wealth of installation options, to create a remarkable water feature. The efficient, wet rotor design is ideal for continuous use, and a large screened inlet accommodates a significant amount of water while protecting the motor from debris. Remove the screw at the base of the screen and release the green snaps to fully remove the prefilter for cleaning or inline installation. The thermally protected design turns off the pump if it gets too hot, and the item is void of oil for the safety of your fish and plants. Its canned motor technology enables the unit to be placed both inline or submerged, and oriented either horizontally or vertically. The 5.75" wide, plastic base creates a stable stand for horizontal placement, and a molded, plastic loop on the back aids in vertical installation. Connect a 1 1/2" female fitting (not included) to the threaded top outlet to accommodate your tubing. The non-corrosive plastic housing, low profile, and versatile design make this pump perfect for your medium falls or statues. Efficiently keep the water in your pond moving with this F-Series Wet Rotor Pump. Two year limited warranty.